Young Reader Reaction: At first our daughter thought this was going to be too babyish, and she giggled at Miles' descriptions. But as we kept reading (she helped too) she settled into to the story and realize that Miles and his parents had "polite" ways of talking about yucky stuff.Adult Reader Reaction: What a wonderful resource! I wish I would have had this book a few years earlier, when my now preteen was first fully understanding the symptoms of an upset stomach.Pros: A comforting story helps young kids who don't understand (or like!) what happens when they get sick. Parents who don't like talking about these things may find the story helpful for explaining it, too.To read our full review, go to The Reading Tub®. You may laugh at the title and the subject matter, but this is a very smart book. The story teaches kids what happens to your body when you have diarrhea. Speaking as a child who used to get tummy aches when she was sick, like the little moose, and did not know what was wrong either, I think that's a great thing to explain in a friendly little book. We have all had it and dealt with it at one point in our lives, so I think this is a story kids absolutely need to have at home. This book also comes with a little handbook for parents on how to take care of a child with gastroenteritis. 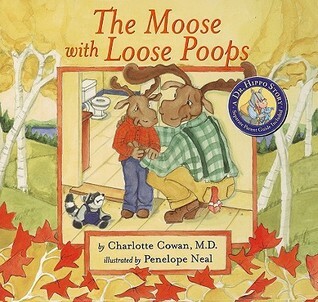 I think it was an amazing book it was funny for me and my family and now i can poop with confidence I think I would recommend this book to everyone because it is very inspiring about the moose who could. I really enjoyed i think everybody can enjoy the humor or the help this book creates. I learned a lot like that sometimes, waterfalls come out of your bottom and that Dr. Hippo likes to talk about poops. Also, I should never allow my wife to add books to my to-read shelf. mwahaha. Not the laugh out loud funny read I was hoping for. Loose poops are SERIOUS! Educational *and* chock-full of bodily functions--destined to be a classic! I read this as a kid. It looks pretty stupid, and it kind of is. When I first remembered reading this book, my first thought was, why would anyone call a childrens that. Either way, pretty funny.